Dimensions: Dining Chair: 18 Inches Wide, 22 Inches Deep, 38 Inches High. Dining Table: 29 Inches High, 42 Inches Round. Rattan Jupiter Style Dining Grouping. This rattan dining set blends comfort with good looks. Designed for smaller spaces with style in mind. This warm natural golden color is too good to pass up! 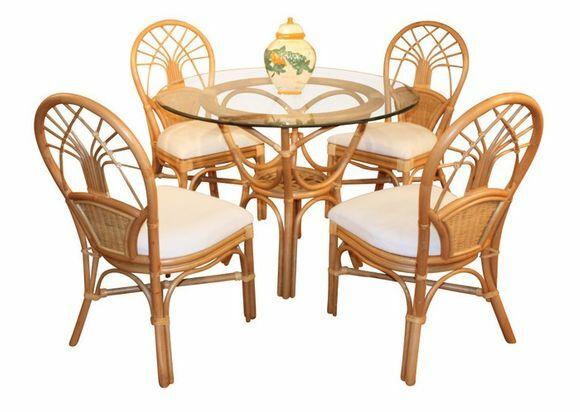 The Jupiter Rattan Dining Set gives your dining room a tropical flair and can blend with any decor. The pedestal table has polished beveled glass and rattan frame is finished in a golden natural rattan. -Leather wrapping at the joints of the Jupiter rattan furniture makes it a long-lasting, durable set. -You and your company will enjoy plush cushions attached to the dining chairs. Armless dining chairs have attached cushions to prevent them from moving every time you do! -Armless dining chairs provide extra space and convenience in your dining area. Dining Chair: 18 Inches Wide, 22 Inches Deep, 38 Inches High.